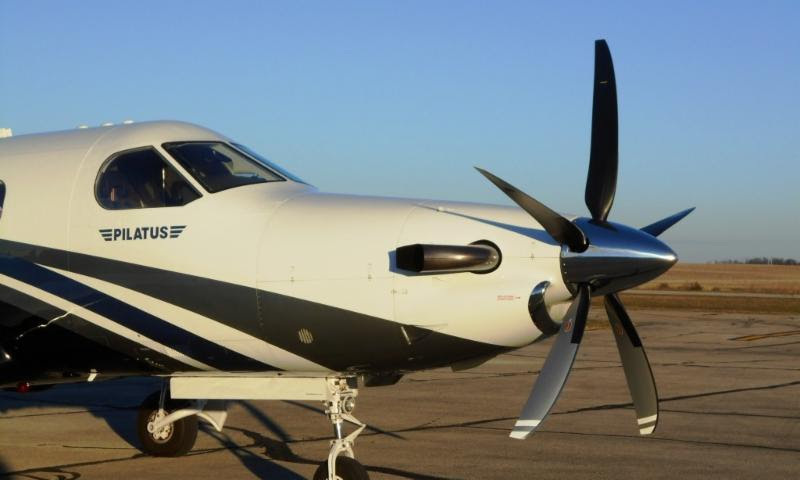 Hartzell Propeller has received an amended STC for installation of the propeller company’s newest five-blade composite swept tip prop on Finnoff Aviation P&W PT6A-67P engine upgrades for Pre-NG Pilatus PC-12s. The new technology five-blade propeller can replace the four-blade Hartzell aluminum propeller that is standard equipment on more than 780 legacy PC-12s. The 105-inch diameter, composite propeller is the same propeller that is also available as standard equipment for Pilatus newest 2016 model PC-12 NG aircraft. Brian Cleary who owns Cleary Benefits Group, based in Connecticut, undertook first installation of the five-blade prop with a Finnoff engine conversion. His company provides health care consulting to Fortune 1000 companies. Cleary is also President of the Pilatus Owners & Pilots Association. Cleary plans to fly his PC-12 with the new Hartzell/Finoff combo to the 20th annual Pilatus Owners and Pilots Association convention to be held June 16-18 in Québec City, Canada. Hartzell Propeller will also have a display at the convention, along with several technical specialists on hand to discuss the amended STC. “Now legacy Pilatus PC-12 operators can get Finnoff Aviation’s 1,200 horse-power engine upgrade and also take advantage of the newest high performance propeller technology available,” said JJ Frigge, Executive Vice President of Hartzell Propeller. Since its introduction just six months ago, more than 100 Pilatus PC-12 operators are already flying with the latest five-blade Hartzell composite technology and aerodynamics. “Clearly, our propellers have been selected by Pilatus as standard equipment because of their exceptional reliability and superior performance. We are pleased to be able to offer the newest technology compatible with even greater engine performance for legacy operators,” Frigge added. With the new five-blade Hartzell propeller, the 2016 PC-12 NG cruises five knots faster, climbs to a cruise altitude of 28,000 ft 10 percent quicker, and has a 50-foot reduction in total takeoff distance. Its highly swept blades reduces flyover and cabin noise and are certified for unlimited life. Hartzell offers the new composite five-blade Pilatus PC-12 amended STC with 3,600 hour/3 year Top Prop warranty. List price for the new Pilatus PC-12 propeller is $83,640, less a $15,000 trade-in for the existing four-blade Hartzell prop installed as standard on PC-12 aircraft. The new structural composite five-blade propeller is seven pounds lighter than the standard four-blade aluminum propeller, and lighter than alternative wood core five-blade propellers. It is approved for EASA countries, Brazil, South Africa, Namibia, Russia and Canada with pending approvals in Argentina and Mexico.